I ended up buying Station Eleven when I was in Waterstones in Hull with a friend, who offered to let me take advantage of the Buy One Get One Half Price deal as he wasn’t interested in buying anything else. 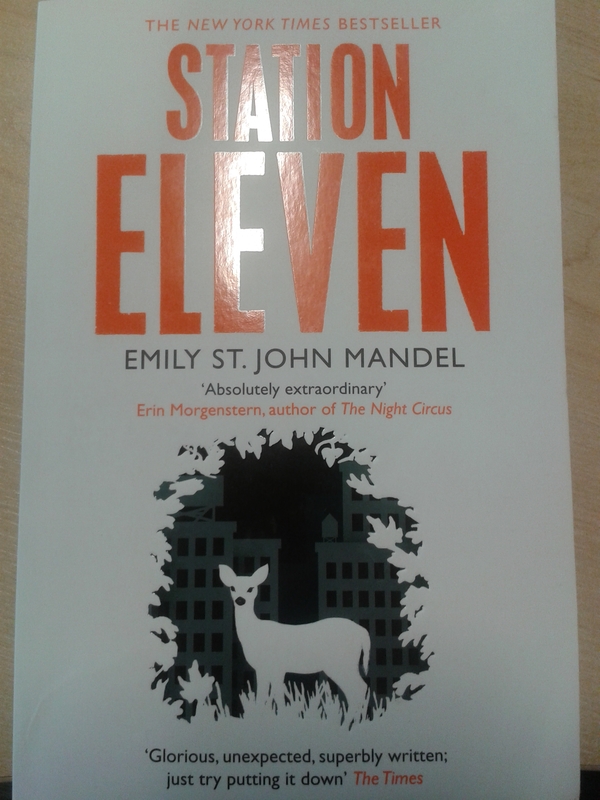 After asking for a recommendation from a staff member, I bought Station Eleven and took it home with me. So congratulations, Waterstones sales assistant. You succeeded in selling a book and satisfying a customer. For me, Station Eleven is the book that Stephen King’s The Stand fails to be. I read The Stand last summer while I was on holiday in Tenerife (I know – not the most relaxing subject matter) and only really finished it because my stubborn personality refuses to let me give up on a book. But after reading Station Eleven, I came away from it thinking, “Now, that’s all King had to do. In far fewer pages than The Stand.” And the similarities between the two are many, in terms of plot and characterisation. At first, I was worried that Station Eleven would be a little too cliché for me, but I did want to give a book a try based solely on word-of-mouth recommendation. I expected to read a novel that was all the recent zombie and/or apocalypse movie themes combined. And I won’t lie, there are some scenes in this book that lift straight from those movies (hoardes of people crowded around a small mounted television screen in a public place, all looking terrified, for instance), but then again, this probably just means that the movies and the books are correctly predicting what circumstances would be like in these types of situations. Each unique character within the book brought richness to the narrative. The central character, Arthur Leander, is a conflicted and egotistical Hollywood star who comes from a humble background and struggles all throughout his life to find a balance which makes him happy. He recognises the superficiality of Hollywood life and misses his quiet life back on the remote island on which he grew up, and yet at the same time he craves the spotlight and feel stifled and claustrophobic when he returns home. His tendency to jump from one wife to the next, each very different from each other, reflects his inability to really understand what he wants from life. In this way Arthur is a personification of the book: while the novel highlights how fragile society is and its obsession with the trivial things such as corporate wealth, social media and celebrity culture, it also demonstrates how lost people feel when it’s all ripped away. Jeevan, the man who attempts to save Arthur’s life on stage, is another such character. Originally a celebrity journalist and then a member of the paparazzi, he eventually moves on to training to become a paramedic, to give his life more substance and to feel that he is contributing to something truly worthwhile. Arthur’s childhood friend Clark reminisces about his corporate life after the collapse, wincing when he thinks of how he used to behave towards other people in his business life. Clark goes on to shave his head in the same manner that he did when he was a teenager. In the face of crisis, he tries to reach back into the days when he felt the most the carefree and a sense of individuality. Kirsten, another major character, was too young when the collapse happened to remember much of life from before. Because of this, all she does is crave the world that her and her friends had taken away from them before they truly had the chance to experience it. She pines for it, but, unlike Clark, who knows exactly what he’s lost, Kirsten mourns what she never had. One of the most striking and interesting characters is the prophet, who for me is quite similar to Randall Flagg (the Dark Man) in The Stand. I won’t give too much away here but the extremity of the prophet’s reactions to the collapse, his so-called ‘spirituality’ and his actions towards other people provides an effective contrast to the other characters in the book. The book, in a non-linear narrative, shows us how the collapse affects each of these characters in turn and how differently they cope with survival in a world where most of what they loved is now gone. What I loved about this book was how it highlighted the stark contrast between what is important in today’s society, and what would be considered important in a post-apocalyptic world. Station Eleven seemed to me to be a social commentary on the state of modern culture. The Travelling Symphony is a group of musicians and actors who travel across North America performing the plays of Shakespeare and accompanying classical music. They are clearly trying to preserve the best, or what is perceived to be the best, of arts and culture in a world where those things have become obsolete. The Travelling Symphony are a characterisation of this sentiment. But this isn’t to say that more modern culture isn’t appreciated in this world. Gone is electricity, gone are computers, and therefore all the social media and the internet crazes that come with them. But these things do have a lasting effect on some citizens. They are viewed as just as magical and amazing and Shakespeare to many. Clark, a key character within the novel, starts up a Museum of Civilisation – preserving and exhibiting any and all objects that they can find from the pre-apocalyptic world. Mobile phones, books, snow globes, bikes all make it into the Museum. Clark had always been fond of beautiful objects, and in his present state of mind, all objects were beautiful. He stood by the case and found himself moved by every object he saw there, by the human enterprise each object had required. The importance of newspapers and literature is also a big theme throughout the novel. Miranda, the main character’s ex-wife and the writer of Dr Eleven (the comic which plays a large role in the book), is wholly dedicated to her art. She cares far more about how it helps her emotionally than getting it widely published and earning money. The importance of the text and art itself lies in the message and the comfort it gives to those who read it. Similarly, the newspaper which Diallo publishes in Year Fifteen in his settlement/town, The New Petoskey News, for obvious reasons does not have a large circulation or commercial impact. But still it somehow manages to find itself in the hands of Clark in the Museum and its contents have significant meaning and relevance to him. Communications, literature and publications survive in a world that is considered doomed. That is a powerful message in a novel in an age where literature and publishing is still largely, and essentially, profit-driven. I could go into more detail, but perhaps it’s best to leave the reader to see more for themselves! I highly recommend this book, to those who are lovers of the genre, but also to those who are looking for something a little different to try. Well done Emily St John Mandel!